I love making casseroles early in the day so that dinner can be a low stress affair. I do my best to keep the kitchen cleaned up before M comes home (since he’s the one who does the dishes after dinner) so this is the simplest way I know to have time to make that goal a reality. Casseroles rock… one baking dish to wash after dinner? Definitely a plus in my book. Additionally, with the schedules that are kept by all who currently live in our house, I’d have to make four separate servings of a meal to get everyone fed. With a casserole, I can make it once and everyone can eat when they’re able, though we do endeavor to sit down together to eat as often as possible. 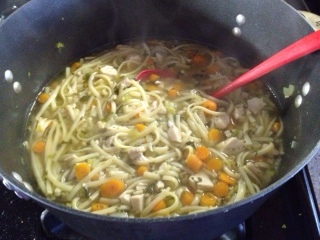 It’s still steamy and the noodles haven’t totally cooked, so they still look pretty yellow. At this point, I put the lid on and let it cook on its own for a bit. I was editing pictures, so I’m really not sure how long it cooked. Once I decided the noodles had cooked enough and turned off the heat. Here’s where the “stroganoff” part came in. In my head, a stroganoff has to have some sort of creamy sauce and paprika to make it into what I think of as traditional. I added some Philadelphia creamy garlic sauce (only because I didn’t have any greek yogurt or sour cream on hand) and that seemed to do the trick. 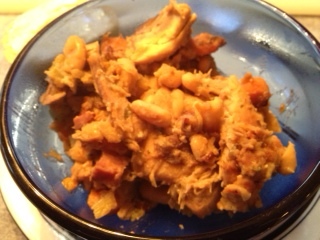 Taste test was a success and I was ready to put dinner in the casserole dish… but it just didn’t look “finished”. I needed buttered bread crumbs to top it all off. 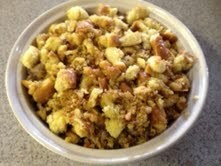 When growing up, my mom’s Buttered Bread Crumbs were the standard by which I judged all other casserole toppings, which mea ns that I didn’t like anything that other people called “bread crumbs”. I now make Buttered Bread Crumbs in the same saute pan I used for the casserole, so I’m including tiny bits of dinner into the delicious topping that will grace this casserole. Today, I used three burger rolls (because that’s what I had on hand, that’s why) and cut them into small bite-sized pieces. I heated some of the really good Olive Oil (seen to the right, a fabulous Olive Oil that I got from my cousin Tami and her hubby Harry) with a few tablespoons of margarine and a little garlic paste. I then tossed in the bread pieces and sauteed this mixture until the bread started to crisp up a bit. Buttery, garlicky, and toasty… that’s the way these Buttered Bread Crumbs should taste! 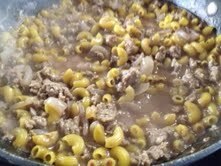 Once the topping was finished, I added them onto the casserole and dinner was ready. M will pop it into the oven tonight and my three guys will have a fabulous home-cooked meal, even though I won’t be there. It’s one of the joys of working odd hours and being happy to use The Force to create something I am sure they’ll enjoy. Wine or no, cooking should be about sharing your joy and passion. I’m just so grateful that my guys appreciate that about me.